1. Prep the table you plan to use. Make sure it's clean—you have the option to add a table runner or fabric to liven it up. 2. Gather your indoor plants and terracotta pots. Depending on the pots you have, you can decorate it using paint! Personalize your planters by painting two-toned colors and adding simple graphic prints on it. You can try designs like scallops, triangles, and polka dots. 3. Once your plants and accessories are ready, start assembling your vignette by placing some of the plants on the table. 4. Add height to your display by placing one or two pots on top of a stack of books. You can also place a couple inside a wooden crate. 5. 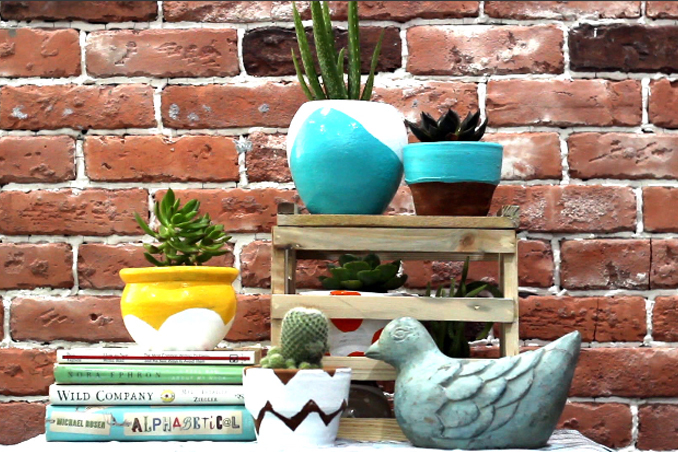 Mix up your display by using various succulents and cacti in different heights and sizes. Complete the look of your setup by adding decor pieces, accessories, and other cute items that blend well with your palette. RL Tip: If you're looking for plants to use, drop by Angel's Bloom Garden in White Plains, Quezon City for wonderful succulents and other indoor plants. For this project, the succulents and aloe plant cost P50 each. Those looking for terracotta pots can also visit Dapitan Arcade for affordable pieces that cost P45 each. Styling by: Jen Inumerable Suarez.